The olive tree is a tree classified in the Oleaceae family. The olea variety to which it belongs comprises about thirty different species in the world. In the Mediterranean, the cultivated species is oleastre, which encompasses many varieties that produce olives of various forms and tastes, and comes from the Oleaster, called wild olive (acebuche in Spanish). A characteristic tree in the Mediterranean landscape, the olive tree olea europaea is the only species of the family Oleaceae whose fruits are edible. Its green fruit turns to brown or black tones when maturing. The oily fraction is extracted from the mature fruit. Along with the green oak (quercus ilex) the olive tree is one of the most typical plants of Mediterranean vegetation. It particularly likes calcareous soils. Sensitive to the cold (except during the vegetative rest period), the olive tree withstands high temperatures if the water supply is satisfactory. The foliage of the olive tree is persistent. It is an evergreen tree that renews about one third of its leaves every year (leaves with a life cycle of 3 years). Depending on the variety, there are large foliage variations, but the leaves, which are 3-8 cm long, are usually dark green (or other shades of grey-green, etc.) with, above and below, a lighter green, silvery, almost white. In the event of a storm, the leaves turn to expose their under-side to the rain in order to capture water, the other side being used for photosynthesis. In herbal medicine, multiple beneficial properties (anti-bacterial, anti-viral, etc.) are attributed to the leaves. In his Natural History , Pliny the Elder, evoked the healing virtues of olive leaves. and senescence beyond 150 years. 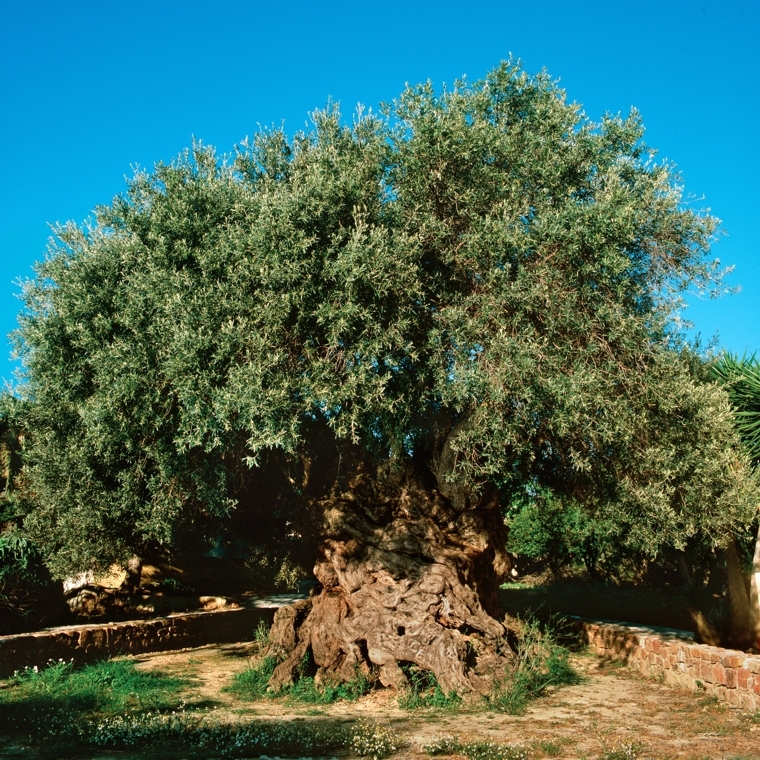 On French territory, the oldest of the olive trees is found in Roquebrune-Cap-Martin in the Alpes-Maritimes department. Planted above a low wall, the roots of this remarkable millenary tree gradually absorb each stone. Among the olive trees considered to be the oldest in the world, the olive tree from Vouves in Crete stands out, whoseage is estimated at 3,000 years or even more. It disputes the title with "Al-Badawi", an olive tree from a small village near Bethlehem. in June, the fruit set (the beginning of fruit development), and the olives ripen until winter. they are generally harvested between November and February, depending on the maturity of the fruit and the preference of the harvesters ("early harvest", for example). lastly comes the moment of pruning, at the end of the winter. It improves the balance of the tree by favouring the branches that will give the most fruit. Different diseases or invasions of insect can affect the tree. The olive fly, for example, lays eggs in the olive, then its larvae develop there, and make the fruit fall prematurely. The olive tree is also prey of a bacterium called Xylella fastidiosa. It was discovered in Europe in 2013; first in southern Italy and then in France (in 2015), and the following year in Spain. There is no known treatment to date (2019) to stop its effect. The only way to limit the damage caused by this bacteria, once the infection is detected, is to remove the trees in the surrounding area to isolate the affected trees. The majority of olive trees are self-fertilising, whereby their pollen is used to fertilise their own ovaries. Fertilisation is mainly done by way of the wind, and lasts for about one week a year. Only 10% of the flowers produce olives. The fruit of the olive tree consists of three parts: the stone, the flesh or pulp, and the skin, the cuticle. It can be used for oil production or as table olives. After pressing the fruit, an olive oil is obtained which is immediately consumable. Conversely, the table olive (or eating olives) must be prepared, and undergoes certain operations for it to lose its bitterness, and to make it edible. press the resulting paste, and allow it to settle to separate the oil from the water before storing it. There are two main methods of extraction: pressure and decantation. 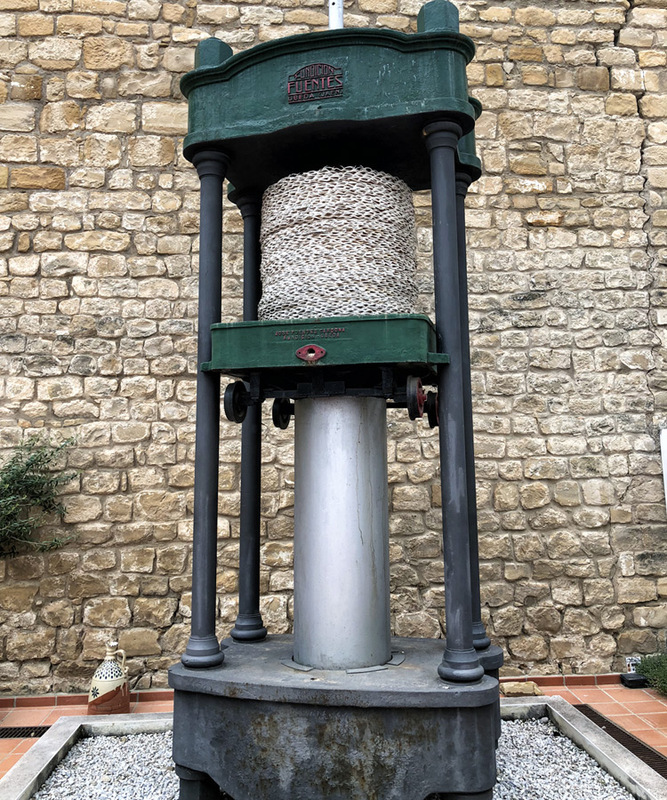 The first, the oldest, is to spread the pulp on discs called scourtins that will retain the solid part (stone and pulp of the olive) while allowing the liquid part to filter. For the more modern decantation, a cylinder rotating at high speed will separate the different components of the pulp according to their density. The oil is finally stored in tanks to prevent oxidation. When are the olives harvested? The olive will go through several stages of coloration (or directly from green to black for some varieties). The colour of the olive depends on the moment it is picked. The olive is vgreen if it is harvested before maturity. It is purplish or "turning" if it is harvested at maturity (this stage of colour change from green to purple is called veraison and happens around September). It is black in colour if harvested after maturity. The fruit is harvested a little before its full maturity, just before reaching its normal size. From this fruit, one can obtain oils with a dominant herbaceous, artichoke-flavoured vegetable, often bitter and fiery taste. Enjoy it uncooked, or simply accompanied by a piece of bread. Green fruit is considered a "modern" taste. Some Italian olive oils are often known for their green fruit, but these are also found in France, Andalusia, and northern Catalonia. 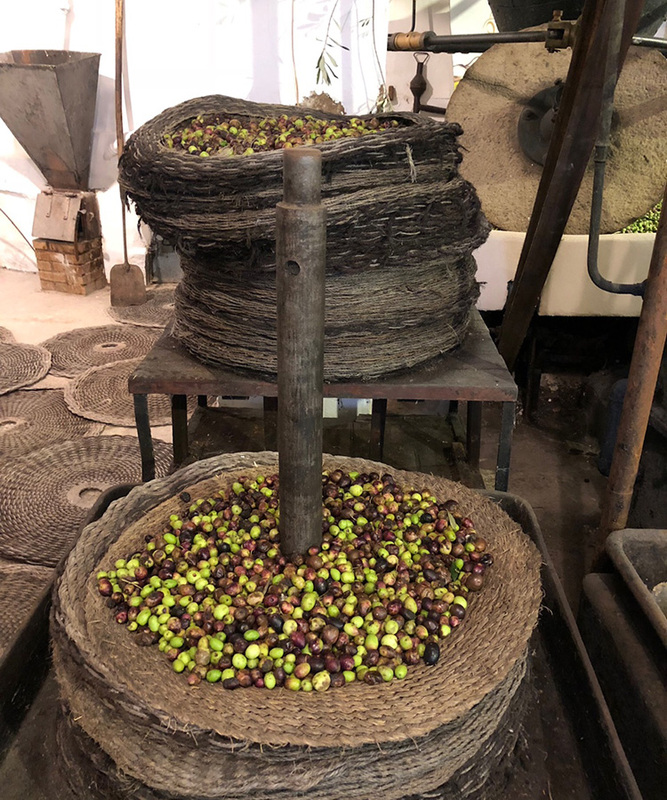 An early harvest extra virgin olive oil (AOVE) is a singular and exceptional product, but producing it is more complex and also more expensive - which may explain its often higher price than that of a traditional extra virgin olive oil. A ripe fruit is obtained when the olives are picked black and ripe. An olive oil made with this type of olives will have a rounded taste and generally sweeter flavours, with less bitterness, less fervency, and aromas of ripe fruit, dried fruits such as almond, and floral aromas like chamomile. The black fruity, comes from a very old know-how based on a very controlled beginning of fermentation of olives to obtain this "old taste", also called "rural". Note: Once mature, the olive only gains water and not oil. The result is a creamy oil without bitterness and without burning, which does not have any vegetal aromas but particular aromas with notes of cocoa and undergrowth. The vast majority of oils produced before the 1960s were from the black fruit. Currently, the trend is more towards the green fruitiness. The type of fruitiness can justify the use of olive oil rather than another in cooking: a green fruit oil can accompany raw vegetables or crustaceans for example, while a ripe fruit would be suitable for fish or with pastry. Lastly, you can reserve the black fruity for spicy dishes or game. In restaurants, cooks make many dishes for which olive oil has an important role; great chefs use this or that AOVE olive oil according to their taste, their feel, their attachment to a terroir, etc. One of the latest surprises we have tasted is an olive oil sorbet, with a very intense taste! Millennium tree and symbol of the Mediterranean, the olive tree has been related to human activity since ancient times. On average, an olive tree produces 15 to 50 kilos of fruit (depending on variety, age, etc. ), and a litre of olive oil is obtained from 5-6 kilos of olives. In the 1960s, Spain was already producing 350 to 400 tonnes, a quantity that was largely exceeded in a few decades, and the forecast for 2019 is 1.5 million tonnes. Situated in Spain for several years and fond of good Iberian sausages since long time ago, the fouder of this store wants above all to share his passionate about gastronomy. After several years of discoveries and tasted in the most remote places in Andalusia, Sierra de Aracena with its "Pata Negra" is, for him, an inescapable place of sausages high end. All our products come directly from their area of Origin Appellation. We work with a local company specializing in transportation. Where to stay in the Sierra de Aracena?